We make insuring your boat a breeze. Kentucky Farm Bureau Insurance covers everything from sailboats and ski boats to pontoons and fishing boats. We provide security and protection for you and your guests on inland waters of the 48 contiguous U.S. states, Alaska, and Canada (both on land and in the water). Our policies also cover the trailer and inboard or outboard motor, as well as attached accessories and equipment. This coverage provides protection against direct and accidental loss to the described boat, motor, trailer and accessories. This coverage provides protection to the insured person who becomes legally obligated to pay damages for bodily injury or property damage. This coverage pays reasonable medical expenses incurred by others subject to all policy provisions. 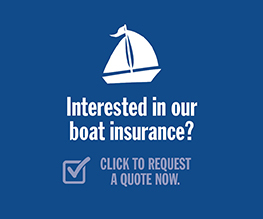 This coverage will pay damages for which the insured or a resident relative are legally entitled to recover from the owner or operator of an uninsured boat. Ask your local Kentucky Farm Bureau Insurance agent about our available discounts. All discounts are subject to eligibility. If you store your boat between the months of December and April, you may be eligible for a discount. A credit is available if you successfully complete an approved safety course. An applicant for a new policy may qualify based on prior boating experience. Coverage availability is subject to eligibility and other qualifications. Please consult your policy for actual contract coverage and exclusions. Kentucky Farm Bureau Insurance has been serving families of the Bluegrass since 1943. We are the largest property and casualty insurance company in Kentucky. We're located where our customers are — in each and every one of the 120 counties in the Commonwealth. Tired of dealing with a computer or answering service? We're hometown people ready to serve you on a personal basis. Kentucky Farm Bureau Insurance is rated A (excellent), one of the highest ratings awarded by the A.M. Best Company, the most respected name in insurance rating services. In addition, we are currently rated an A+ with the Better Business Bureau (BBB). BBB ratings are based on 13 trust-related factors, including fair and appropriate handling of any customer complaints filed with BBB, business stability as represented by numerous years of business, and compliance with BBB’s Standards of Trust. Click here to file a claim. Breathe easy and rest assured that there's a Kentucky Farm Bureau Insurance Regional Office with local adjusters near you. For answers to frequently asked questions regarding boat claims, click here.